Teach Math to young children using these simple materials. With a little help from grownups, almost anything can equal math discovery for kids. Take ordinary drinking straws, for example: fun for drinking juice and even for spitballs when you’re not looking, but also fabulous for learning math. Here’s a hands-on activity to help teach your child the classic first grade topic of place value—what you probably remember as telling the difference between the “ones, tens, and hundreds” columns in a number. Build real numbers. 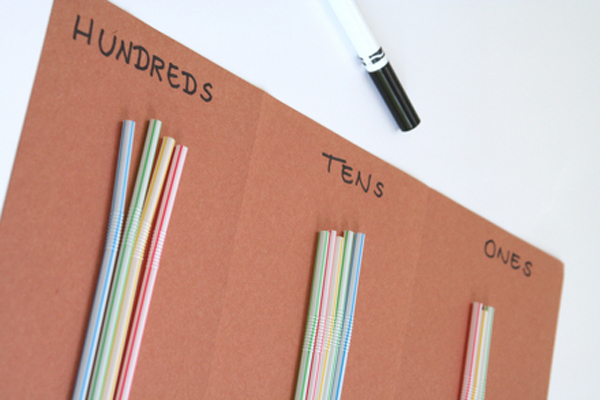 Now have your child represent each number on the placemat using the plastic straws. For example, if the number is 258, they would place 2 straws in the “hundreds” column, 5 straws in the “tens” column, and 8 straws in the “ones” column. Have them count aloud as they lay down the straws in each column. For example, count by hundreds saying “One hundred, two hundred,” Then by tens saying ” 10, 20, 30, 40, 50.” They can then count by ones saying “1, 2, 3, 4, 5, 6, 7, 8.” They can end by saying the whole number out loud, with pride and satisfaction. Repeat this process for each number on the list! “Place Value” is a concept that underlies every major mathematical skill to come, whether it’s addition and subtraction or more advanced concepts like decimals. By arranging digits this way, you’re helping this knowledge become automatic, and you’re providing an organizing framework for how our number system works. Oh, and while you’re at it, you’re also modeling a sense of discovery and a love of learning that can last for decades to come. Not bad for a short afternoon homeschooling activity!